I got a copy of “The Camp Naish Story” from Jody Tucker over the weekend (thanks, Jody). As I was reading it I found something of interest. It is a page that includes Camp Naish stationery. 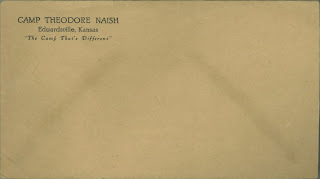 The caption at the bottom states, “The First Camp Naish Stationery and Postcards.” Of particular note is the difference in font between the stationery I posted a couple of weeks ago: The Camp That’s Different also, the envelope shown has additional text that states, “Boy Scouts of America” while that text is absent on the other stationery. 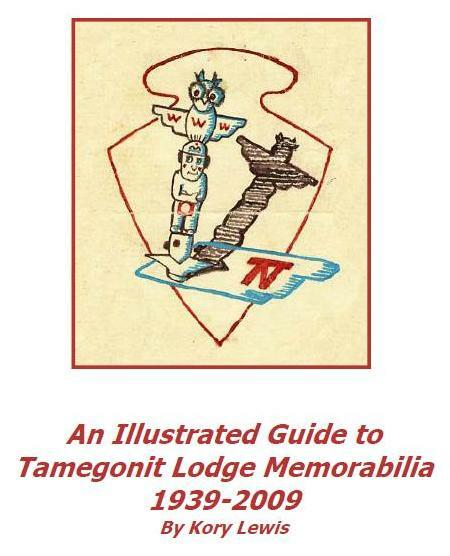 I am pleased to announce the publication of An Illustrated Guide to Tamegonit Lodge Memorabilia 1939-2009. The book includes over 140 pages and contains high-resolution images of all of the major patch and flap issues from Tamegonit Lodge #147. In addition, there are sections on rare and one of a kind items, arrowhead neckerchief slides, prototypes and paper items from the lodge. Each chapter includes a narrative section and full color images of Tamegonit Lodge memorabilia. Up first is an interesting piece of ephemera from Camp Naish: official stationery. 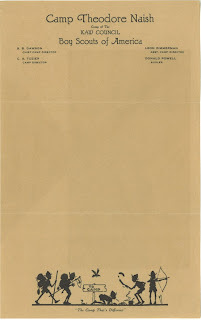 As shown below, there is a piece of paper with Camp Naish letterhead and coordinating envelope. The letterhead notes B.B. Dawson (Kaw Council executive from January 1923-March 1933) as the Chief Camp Director, Leon Zimmerman as Assistant Camp Director, C.A. Tozier as Camp Director, and Donald Powell as Bugler. It probably dates from between 1928 (first camping session at Naish) and 1932 (Dawson left the council in March 1933). Click on the images for larger versions. The envelope lists the location of the camp as Edwardsville, Kansas. I generally think of Bonner Springs when I consider the location of the camp. The camping scene at the bottom of the page made me realize that scouts have been using clip art for a very long time. I wonder how long the slogan, “The Camp That’s Different,” was in use? Finally, I wonder if this stationery was available to scouts at the trading post or was it for official use only?